Diversification in an organizational can be implemented by (i) grass root development, (ii) acquisition, and (iii) by joint venture. Management of diversification is quite complex and needs special skills. Further the diversification can be misfit, partially fit, or successful as shown in Fig 1 and described subsequently. Management of diversification becomes a misfit, if the management while planning the diversification has ignored market as well as the technology. The diversification is sometimes considered partial fit if it is successful but exceeds the ability of the organization to manage, or if the organization is needed to do something it cannot or should not do. For the management of diversification, it is essential for the organizational management to know what to do if a product which looked like a logical extension of the organizational market turns out not to be accepted in that market, because of the consumer defines the market differently from the way the producer does. Management is required to know what to do with developments which come out of organizational operations or technology but do not fit into a frame of common understanding. The development may be too promising to be given up. Yet to try to fit it within organization’s operational structure is likely to create splintering and to diffuse. Managing diversification needs that the management knows what to do in case the organizational operation finds that its technology branching increasingly into different directions which have lesser and lesser in common with one another. Sometimes it is the most successful new development which turns out to go out of bounds and to threaten, by its very success, to make the whole organization unmanageable. Every management wants to hold on to the misfit of diversification while continuing to have a manageable organizational performance. Unfortunately, this does not happen. Management which attempts this soon find out that it is in a difficult situation and that situation ends only when the misfit is got rid of. But usually the misfit, when viewed by itself, appears highly promising or even apparently successful. The typical example for this is the development of tetraethyl lead to cure the knocking problem in the automobile engine by General Motors (GM) of USA in the twenties. This was not only a scientific achievement, but also an economical achievement since knocking was a major obstacle to customer’s acceptance of the high-performing but economical automobile engines on which the GM management had based its entire strategy. Yet tetraethyl lead was clearly a misfit in operations of GM. It was a petroleum product needing a different distribution system, rather than a product of an automobile producer. It was a clear case of misfit for the operations of GM. The GM management solved this misfit problem by teaming up in a joint venture by name ‘Ethyl Corporation’ with ‘Standard Oil’ which had the distribution system. This resulted into higher profit for GM than carrying out the activities of a petroleum company itself. At the same time it maintained the essential manageability of GM. Ethyl became a separate business under its own management of chemical engineers and chemical marketers. The joint venture is, of course, only one way to handle the promising or successful misfit. But whatever the way chosen such as joint venture, outright sale, licensing, or spin-off into a separate business etc., the way is required to lead to a clear managerial separation of the misfit. If the misfit is to succeed, it needs a separate management, since misfit has a different technology and different market which the organizational management needs to know, understand, and manage if the misfit remains part of the organization. Misfits like tetraethyl lead are relatively rare. Far more common are ‘partial fits’. The usual situation is that the new product or technology which does not fit since its success needs its own market and its own customers, but it also constitutes an important supply to the originating operations or an important customer for one of the organization’s own products. GM needed that tetraethyl lead is to remain available to its customers. Yet not one drop of the material was the part of a GM product. In another example the situation was quite different. An electric manufacturing organization decided to develop a whole family of new plastic compounds, which had promise to have uses across a very wide range of industries and products. The funds needed for the development would have been uneconomical in case there was no such large market. But, around 90 % of the potential market was outside the organization’s requirement and only the remaining 10 % amount was needed for the plastic compound as component of the organization’s own products. Yet the organization decided to develop the new chemicals itself. In this case, while the new product was a roaring success, the organization could not get advantage of the success and the benefit was enjoyed by the chemical organizations which used the inventor’s original patents. It would have been better for the organization, if it would had licensed the new technology for the plastic compound or at least been made the basis for a joint venture with a major chemical producer. The above examples indicate that the diversification is manageable if the contribution for the development of the new product which promises to provide a profitable and new access to market for an existing product of the organization is essential, but if it is incidental, then it is better that the new development takes place on its own. The partial fit is the most dangerous temptation in diversification into new product. The half knowledge is always more dangerous than the totally unknown. In such a case the organizational management only deceives itself when it believes that it really understands the new product. It is also so easy for the management to deceive itself into believing that it can really make a crucial contribution to its development and success of the new product. But what the management does not understand about the new product is likely to turn out to be critical, if not decisive. This can be explained by taking an example of a pharmaceutical organization which diversifies into perfumes and cosmetics products believing that its chemical and compounding knowledge is going to make a major contribution. But the key to perfumes and cosmetics is fashion, marketing, promotion, and image creation and all these are well beyond the operations of the pharmaceutical organization, let alone the values of the organization. Diversification which results in misfits or partial fits, damages or destroys the organization’s core operations and makes the organizational operations of the wrong size. The very least which is needed is that the diversification does not endanger managerial unity, managerial clarity, and managerial concentration on the organization’s original operations and opportunities. Investment in the diversification is required to be judged by the same criterion as any other decision to invest outside of the organizational operations. That is, it is necessary to find out the best investment opportunities of the capital available to the organization, otherwise, it results into splintering of scarce resources. And if not the best or a very good investment opportunity, divestment, either in whole or in part such as sale, licensing, or joint venture, is preferable. This not only brings greater direct returns. Freeing management for what it can and should do is likely to bring even greater indirect results. To manage diversification, management has four tools available. Two are tools to diversify which are (i) development from the beginning (often called grass-root development), and (ii) acquisition. The third is the tool to cure unsound diversification that is divestment of misfit or partial fit and the fourth is the tool both to diversify and to get out of unsound diversification that is the joint venture. Grass-root development and acquisition are often considered as royal roads to diversification and growth. But it is not either/or. These are alternatives with one important problem that they are complements. It is often said that acquisitions needs higher funds than grass-root developments, but telescopes time. This is not necessarily true. Many grass-root developments require higher funds than acquisition would have required. At the same time, many acquisitions take longer to produce results than an energetically pursued grass-root development venture. It is rare to have an acquisition which is exact fit whether in markets, products, or people. For making an acquisition truly serve the purpose for which it has been made may take a long time. Until then it is unlikely to produce the results for which the acquisition has been made. It is often said that an acquisition, while more expensive than grass-root development, is less risky. This is not true either. The proportion of acquisitions which turn out to be expensive mistakes or at least disappointments is substantial. And while the failure rate of grass-root development is higher, most of them can be recognized as mistakes and liquidated early, before the investment has become large. It is also often said that one can never be sure of a grass-root development. There are always surprises and some of them are pleasant surprises. But, the one absolute certainty in acquisitions is that the day after the contract has been signed, skeletons of all sizes and shapes start coming out from everywhere. In fact, grass-root development and acquisition require different approaches and different dispositions, pose and require different questions to be answered, and run into different kinds of problems. Both have in common, however, that they must be grounded in a diversification strategy. Only desire to grow, or to do something different, is unlikely to produce results in either approach. What is needed for the organization’s operations is to be the starting point for both successful diversification from the grass root as well as successful diversification through acquisition. But thereafter the two approaches differ in essentials. They are indeed so different that few of the organizations are likely to do well in both grass-root development and acquisitions. The organization which finds it constantly unlucky with acquisitions is to stop making them. It is not the acquisition which is unlucky. It is the lack of the temperament for making the acquisition work. The organization is not prepared for the difficulties, troubles, and problems which unavoidably follow the most harmonious and most logical acquisition. Similarly, the organization which is consistently unlucky with grass-root development is not unlucky. In fact, it does not understand the problems of the new and the growing. It does not have the innovative capacity. Neither the organization finds it easy to acquire what it lacks. Every management may need to diversify. It may be able to do it either by the grass-root development or by the acquisition. But the management is required to know which one of these two tools of diversification fits its temperament, its way of doing things, its abilities. And then it has to work in the direction. It is better to have great skill and strength in one way than to try both the ways without skills in any of them. The basic approaches to grass-root development and to acquisition are different to begin with. In deciding to initiate or to go ahead with a grass root development the key issues are (i) whether it can contribute to the organization, (ii) what it can do for the organization, and (iii) whether the new capability, the new strength, new market or new technology has the promise to produce for the organization. On the other hand, in acquisition the key issue is the contribution which can be made to the new acquisition. Unless the acquiring organization can make a contribution which significantly raises the capacity of the acquired unit to perform and to produce results, it is unlikely to be a successful acquisition. There is an example of an organization which has grown in fifteen years from tiny to fair big-size, and to outstanding profitability, by an acquisition strategy based on careful analysis of what it can contribute. The organizational activities are to make parts and supplies for manufactured products, either mechanical or electronic. And the organization does have substantial manufacturing ability. But it sees itself primarily as an industrial marketing organization with proven ability to develop markets and distribution for industrial products. It constantly looks for successful small to medium-sized organizations which have engineering and manufacturing leadership in products of this kind but which are being run as manufacturing, rather than as marketing organizations. When it finds such an organization it proposes a joint study to the organizational management. If the study shows to the satisfaction of management in both the organizations that a systematic marketing approach would indeed result in substantial increases, an acquisition bid is made and usually, at a generous price. In most of the cases, all such bids have been accepted. And in almost all such acquisitions the organization has made the results which have come up to the expectations, usually within a fairly short time. There is one compelling reason for basing an acquisition on the organizational ability to make a contribution. It cannot be taken for granted that the management of the acquisition will stay after acquisition. However there are strong chances against its staying on. And when the acquiring organization is to provide management, it is better to lead from strength and be able to contribute what the acquisition needs. This is not normally a problem in grass-root development which is the strongest argument for it. There one can acquire in the course of the development what abilities, skills, competences are needed. People can learn. In an acquisition, people have to possess these abilities and competences when the organization goes in for acquisition. There is another strategy known as ‘grass-root-for-acquisition’ strategy. Precisely because the key to successful acquisition is the contribution the acquiring organization can make to the organization it acquires, grass-root development can provide the foundation for acquisition. And because a grass-root development often runs into a ‘wrong size’ where it needs to make a quantum jump such as to a bigger distribution system, a bigger deposit base, or a broader technology, acquisition is often the best way to make productive a grass-root development. But it needs first the rare ability to perform both grass-root development and acquisition. It needs purposeful strategy even more. The unsuccessful misfit of diversification is to be put out of the misery of the organization as fast as possible. Otherwise it becomes a drain on the resources of the organization and a crushing burden on its management. A diversification strategy whether pursued through grass-root development or through acquisition, requires a systematic and purposeful policy for abandoning the misfit. The successful misfit or partial fit should not be let go. But it should be moved out of the managerial system. It should be divested. One reason for this strategy is that a growing and successful misfit or partial fit needs capital and can obtain it itself. But such an organization also needs genuine managerial independence. It is unlikely that it can realize its full potential if dominated by another management whose interests, vision, and preoccupations are focused on its own operations. And hence a misfit or partial fit will do better standing on their own feet. For the majority of successful misfits or partial fits financial as well as managerial divorce is the right thing from the start. Divestment is ‘marketing’ rather than a ‘selling’ problem. The question is not to whom or at what price the disinvestment is to be made, but it is whether this venture has value and under what conditions. It is, of course, a financial transaction. But the salient point is finding the potential buyer for whom what is misfit to the seller is perfect fit, the buyer to whom the venture to be sold offers the best opportunity or solves the worst problem. This is then also the buyer who will pay the most. An example of a major printing organization can be given. The organization had decided that a mass-circulation magazine it owned was at best a partial fit and needed to be sold. The magazine had been bought originally to hold its printing contract. Then it had been in difficulties. Under the printing organization’s management it had been turned around and was now moderately successful. But the printing organization executives knew that it required new directions and new strategy. They themselves neither were, nor intended to become, publishing experts. Indeed they had concluded that they already spent far too much of their time on an activity which they did not really understand. They realized that the magazine needed publishing management of a high order. Then they found the value to a magazine publishing company and especially to a growing magazine organization. They found that the need is cash for the growing magazine organization since a growing magazine needs heavy cash investments in building circulation for several years. Then the strategy was to supply this need of the potential buyer to the printing organization’s own advantage. And the printing organization offered 90 days rather than the customary 30 days to pay for the print and paper bill to the organization’s printing plants. For next to investment in circulation, printing and paper make the largest cash demands on a magazine. The printing organization then rapidly found a publishing group which filled the requirements. The group gladly bought the magazine, paying more for it than the seller had expected to get. They could, however, well afford to do so. By getting cash financing for their own needs, they still came out with substantial cost advantages. The seller almost doubled what to him mattered most. He got the magazine printing business, as he got the printing contracts for the buyer’s other magazines. He did so at minimal risk. And within two years the buyers had increased the magazine’s circulation and advertising revenues substantially. An old proverb says that ‘In looking for a husband for your daughter, do not ask who will make the best husband for her, but ask instead for which kind of a man would she make a good wife. This is the right rule for the divestment of a successful or promising misfit or partial fit. The joint venture is the most flexible instrument for making fits out of misfits. It is of great importance. It is at the same time the most demanding and difficult of all tools of diversification and also the least understood. There are several kinds of joint ventures. Each of this kind serves different purposes and has different characteristics. There is, first, the joint venture in which the strengths of two different and independent organizations are pooled together in a jointly owned new organization. Each of the parent organization contributes what it can do. The resulting whole is always different from the sum of its constituent parts. The Ethyl Corporation was an early example. A more recent and much smaller one is the joint venture set up by BOAC, a major airline, and Leasco, a computer leasing organization, to supply to smaller airlines a reservations system for airline travelers. This venture combines the programs and process data which BOAC has developed for its own reservation needs with the computer expertise and the financing capability of a major computer-leasing company. BOAC saw the opportunity of converting a cost centre into a profit centre. But it also realized that except as a joint venture, that is, as an independent organization, this would be the wrong diversification. It would require the financial strength which BOAC does not have. And it would detract from BOAC’s own efforts to run its own business in a highly competitive industry. The second kind of joint venture attempts to make a viable whole out of several misfits which by themselves cannot survive. It attempts to provide a quantum jump from the wrong size to the right size and from the nonviable to the viable. Here all partners make essentially the same contribution, though in varying proportions. The whole, however, is to be greater than the sum of its parts, simply because by itself each part is well below the threshold of effectiveness. One might call this as ‘aggregation by joint venture’. Here belongs the ‘consortium’ concept which is quite common in the banking industry where the consortiums are formed for the purpose of engaging in large lending. The partners are usually several banks under the leadership of one bank. The banks are all big and powerful in their own right. But none of them has the financial strength to provide the level of loan required. Joint venture is quite common in several industries. It is done mainly to harmonize various obstacles being faced by individual organizations. Sometimes the reasons for joint ventures are political rather than economical. The joint venture sometimes is something more important than an economic marriage of convenience. It is a way to reconcile the conflicting realities of an economy that is worldwide and of a political system based on the nation-state. It is a way to make productive the tension between two different kinds of power namely (i) economic power, and (ii) political power. Whatever the reason for a joint venture, the rules, which all of them need to observe, are pretty much the same. They have to be known before an organization engages in a joint venture. Otherwise, no matter how successful the joint venture, there will be grief. Indeed the more successful a joint venture, the more trouble there will be unless all the partners, and their child, the joint venture organization, fully understand the ground rules. Joint ventures can, of course, get into trouble because they fail. But then it is reasonably clear what to do. And then the interests of both partners are identical. Both want to straighten out the problem. And if the joint venture cannot be saved, they want to get out with minimum loss. But when a joint venture succeeds, it becomes problematical. For then it always becomes clear that the interests of the parent organizations are not identical and are, usually, barely compatible. Hence, the first rule for joint ventures is to spell out in complete detail and with honesty the three sets of objectives consisting of two sets of objectives of the respective parent organizations, and the objectives of the joint venture organization. It is crucial to bring out, in advance, the basic differences in objectives which the two parent organizations can be assumed, with very high probability, to hold. The objective simply leads to trouble after a few years, which says that the joint venture organization to grow, to prosper, and to be profitable and nothing else. Several joint ventures have failed since they were successful. After success the two parent organizations began to disagree as to the direction and the policies which the joint venture organization is to follow. Neither understood that the objectives of the other had been different from the start. Indeed both assumed that the objectives had to be the same for both. And, after the initial success, when the differences crops up, then the two parent organizations find themselves in such irreconcilable conflict that these joint venture is required to be liquidated with one or the other of the two parent organization taking over. Hence, even when the objectives have been spelled out in advance, there is danger of disagreement among the partners, and again, especially in case of success. And both being the parent organization being equal and normally equally stubborn as well, there is no one to resolve it. Therefore, it is necessary that a way to make a decision in case of disagreement or deadlock is to be built into the joint venture from the start. Normally this is done by providing in advance, for instance, for referring the disagreements to arbitrators, whose verdict is to be considered as final and binding. One problem to which a joint venture organization is particularly prone is politicking in which the people within the joint venture try to play off the parent organizations against each other. This can spoil the atmosphere to the point where the joint venture organization ceases to be viable. Hence, it is essential, to provide in advance for settlement of disputes arising later. The joint venture has to have autonomy. The reason for forming a joint venture is that a business, a product line, a market, an activity, does not fit into the structure of either of the parent organization. Then the joint venture must be set up so that it can develop its own business, its own mission, its own objectives, its own strategy, and its own policies, in true autonomy. The joint venture organization needs its own management. It is not part of any of its parent organization, but a separate organization. In case if there are certain issues with a separate management then it is needed to be managed entirely by one of the parent organization. Joint management usually does not work and only leads to frustration. Finally, if the joint venture succeeds, and especially when it gets to be a big organization, it is to be spun off. It becomes too big and too successful to be a joint venture any longer. Maybe the parent organization still retains an investment. But the organization then becomes independent for all intents and purposes. It is to acquire at least a minority of outside shareholders where capital markets permit. The organization is to finance itself, or at least be capable of self-financing. Otherwise it is going to be undersized. Sometimes a joint venture, especially if it is of the aggregation type, may be split up and divided between its parent organizations. This is usually painful. But it may be the right thing to do. To keep an organization as a joint venture after it has become a big and successful organization retards its growth. Even if objectives are clear and management autonomous, a joint venture organization still is looked upon by its parent organizations as a tool for their objectives rather than as an organization on its own. And once the organization has become established and successful, this is wrong policy and wrong posture. It is fair to predict that the diversifications will be of even greater importance in the years and decades to come. The pressure of the new markets especially the mass market for investment and capital, and the mass market for jobs and success, the emerging world economy, the dynamics of technology, will all push the organizations toward diversifying. 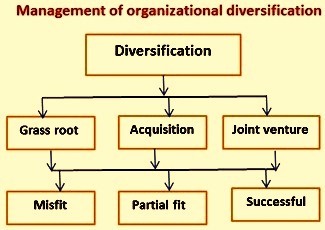 Hence, it is of utmost importance for an organizational management to understand what pressures to accede to and what pressures to resist for distinguishing between sound diversification which strengthens unity and manageability, and diffusion which splinters since the management is needed to be able to manage diversification.